The tutorial will be split in two parts. The first, which you can read below, covers the set up, directory structure and database. In the next part we will cover the routing and views. Read part 2. Our node.js application will be built on top of the Express framework, will use the handlebars engine for templates, and nedb for storing data. The app will allow visitors to vote on photos, one picture at a time. There will also be a rank list with the photos sorted by votes. Only one vote for a picture per IP address will be allowed. To follow this tutorial, you need to have node.js installed on your computer. This is straightforward - simply grab the correct package for your OS from node's download page. If you are running Linux or OSX, you will have to extract the archive somewhere, for example in $HOME/node (where $HOME is your home directory), and add $HOME/node/bin to your path by editing your .bashrc file. If you are running Windows, use the provided installer on the download page. If everything works correctly, executing the node command in a console window will give you node.js's command prompt. If you wish to run the application at this point, you have to download the source code as a zip from the button near the top of the article, and extract it somewhere on your computer. You then have to navigate to the folder where the index.js file is located, and run the npm install command. This will download all the required libraries from the npm registry. 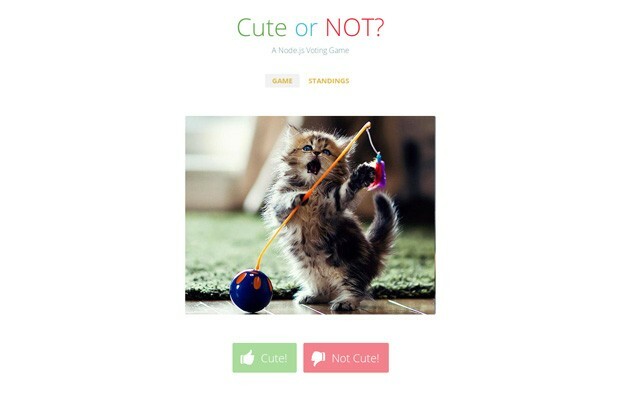 Then all you need to do is to run node index.js and you will have your very own picture voting game on your computer! Because the application allows only one vote per photo from IP, after you've voted on all the photos you can delete the /data/users file to be able to vote again. First, lets explain how our project will be organized. It will consist of a number of folders and files, that you will have to create manually. The data/ folder holds the nedb database files. They are plain text files holding JSON documents - you can even open them in a text editor and edit them. The node_modules/ folder is created automatically by npm when you run the npm install command. This is where the downloaded libraries are saved. The views/ folder contains the templates that are used by the application. They are run through the handlebars templating engine beforehand, as you will see when we discuss the routes file next time. The package.json file describes the dependencies of your app (which libraries from the npm registry have to be downloaded), the name, license of the code and other information. We will be creating this file in the next section. The .js files contain the logic of the application. They are organized as node.js modules, and are included by index.js, which is also the entry point of the application. You run the app by executing the command node index.js. Create each of the folders and files. You can leave the files blank for now. (Of course, you could install all three with one command.) These commands will instruct the node package manager to download the express, nedb and express3-handlebars libraries from the registry, to save them to the node_modules directory, and to update the dependencies property of your package.json file. Our app needs two types of data sets - one for the photos, and another for the users. There will be one record per user, and each will hold an ip address and an array with all the pictures the user has voted on. In a regular database like MySQL we would have made a separate database table with the votes, which would have complicated things, but there is no need to do it like this here. // Initialize two nedb databases. Notice the autoload parameter. One more thing that this module does, is to scan the /public/photos folder (where our cat pictures are stored) for files using the built-in fs module. The photos are then inserted in the photos dataset. The value assigned to the module.exports property, is the result that will be returned when database.js is require()-d in other files. This concludes the first part of the tutorial! In part two you will see the rest of the modules and the views. Read it here. BTW, on line 60 of Routes.js you're passing to the template all_photos instead of your newly created sorted_photos. Thank you for spotting that! The sorted_photos assignment is unnecessary - the sort method changes the original array anyway. I will remove it for part 2. Is there a chance to load pieces of text instead of images? If yes, then please do give a hint how to accomplish that. i noticed if you vote on all of them, if another visitor (from different ip) it shows them they all have been voted on. This shouldn't happen. Depending on how you've deployed your node.js application, you may need to add the 'trust proxy' express setting. Some hosts run your node apps behind nginx, or another proxy, so that all ip addresses the app sees are 127.0.0.1. The trust proxy setting fixes this. Thank you again to bring this to us, Martin! Works great, simple, and clean. Do you have any tutorials on setting up node js on a live server. Can you point to some links that would be great.